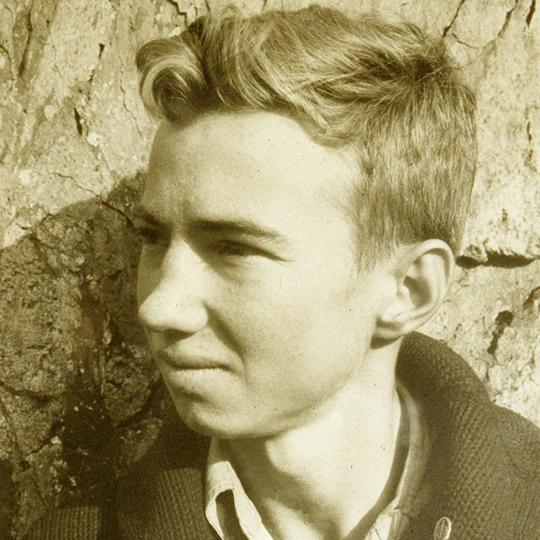 Glen Dawson, one of the most significant climbing pioneers of the 1930s, died at age 103 on Tuesday, March 22. 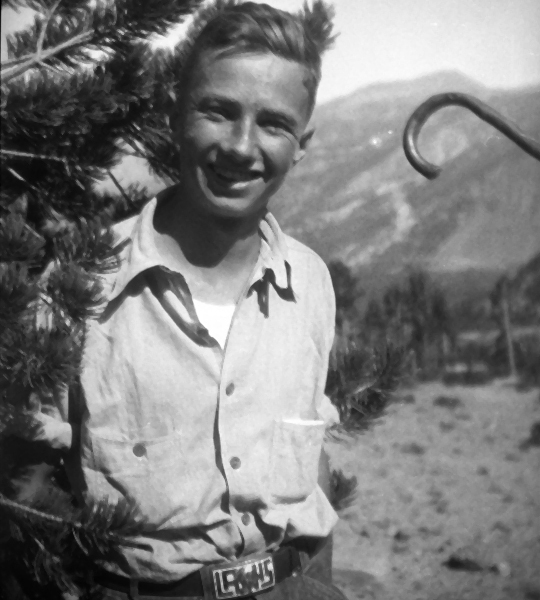 In the 1930s, Dawson was part of a new climbing age in North America, ushered in by Robert Underhill, Francis P. Farquhar, Jules Eichorn, and others. These climbers employed techniques including "piton belays and running belays," which were new in California, historian Steve Grossman told Alpinist. Many historians agree that Dawson and Jules Eichorn's first ascent of the East Face of Mt. Whitney, in 1931, was one of the most important routes of that time. Nylon ropes hadn't yet been invented in the 1930s, and climbers made ascents in hobnail boots. "It was the classic era of 'the leader does not fall,'" continued Grossman. "They pushed climbing into what is considered 5.8 now. Glen and Jules were wiry little guys who could climb quite well. They were the ones who wanted to be the first up all these formations. "[Glen was] very understated, and he didn't go on about himself. [He] had a classic mountaineer's love of exploration—more so than technical ability, which is understandable considering the tools at the time. It was exploration versus execution." Four-week-long Sierra Club High Trips, some attended by John Muir, began in 1901. Under the leadership of Bill Colby, and much later Richard Leonard, the groups roamed across the High Sierra, often with a couple of hundred members and perhaps as many mules. These expeditions occasionally went farther afield, notably to Yellowstone National Park, Glacier National Park and the Canadian Rockies. Glen Dawson from Los Angeles and Jules Eichorn from San Francisco, both 15-years-old, made their first shared High Trip in 1927. Glen got involved through his father, Earnest, who was a prominent Southern California Sierra Club leader and later a Club president. Eichorn was introduced to the Sierra Club through photographer Ansel Adams, a family friend, and he helped Adams carry his camera gear. The boys struck up a climbing partnership near the end of the 1929 High Trip, and they agreed to team up the next year. From 1930 through 1934, together and with other partners, they made increasingly daring climbs. In 1931 it was a natural choice for Francis Farquhar to pair Dawson and Eichorn, then 19, with Norman Clyde and Robert Underhill for the first ascent of the East Face of Mount Whitney, which they completed on August 16. Doug Robinson wrote in his Palisades Mountain Profile in Alpinist 48: "As the Sierra Club Bulletin editor, [Francis P.] Farquhar...invited Harvard professor Robert Underhill, who'd learned the most current climbing techniques in the Alps, to teach ropework to Californians [in 1931]. The students included two teenagers, Jules Eichorn and Glen Dawson, who dominated local climbing for the rest of the decade. They called it the Underhill Camp. In graceful cursive on Glacier Lodge stationary, Dawson wrote home, 'I may not have such a chance again for a long time....' Underhill showed the students how to brace the rope over a block or spring it over their shoulders to cushion a toprope fall." Members of the Underhill Camp went on to apply their climbing skills to technical ascents throughout the Sierra Nevada. "I am notable only as an historical curiosity or perhaps as a living fossil. My career as a rock climber spanned the years 1927 to about 1938. During my lifetime I have been an antiquarian bookseller and publisher but that one event of August 16, 1931 is my footnote in climbing history." "I first connected with Glen Dawson and his early climbing partner, Jules Eichorn, in 1989. I was then chair of the Sierra Peaks Section (SPS) of the Sierra Club's Angeles Chapter. I had arranged for them to be the featured speakers at our annual banquet. Jules later had to bow out due to the flu, but, with support from his brother Muir, Glen gave a marvelous presentation on early Sierra Club climbing. This event led to my creating a six-part series of articles for the SPS newsletter—A Tribute to the Honorary Members of the Sierra Peaks Section: Norman Clyde, Glen Dawson and Jules Eichorn. The complete series of articles, which extends to 2008, is available on sierrapeaks.org. "I was privileged to enter into lasting and rich personal friendships with both Glen and Jules [the latter died in 2000]. They were both very welcoming to all and low key when describing their exploits. Glen especially had a wry sense of humor, and you had to look for the wink in his eye. Surprisingly, until virtually the end of his long life, Glen had amazing recall of his climbing career back in the 1930s." 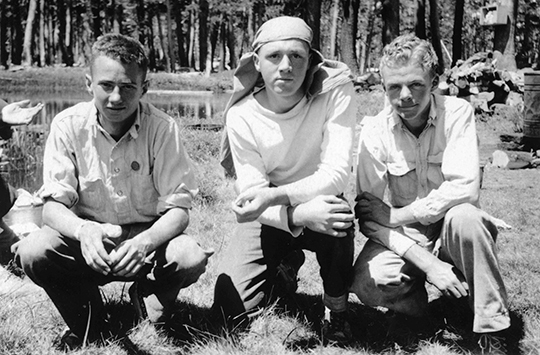 Top: left to right, Glen Dawson, Jack Riegelhuth and Ted Waller on a 1934 Sierra Club High Trip. 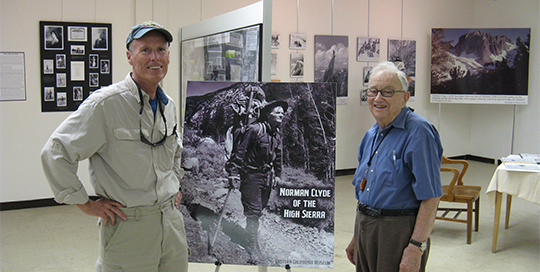 Bottom: Bill Oliver and Glen Dawson at the Norman Clyde Exhibit at the Eastern California Museum, July 2009. [Photos] Top: Bill Oliver Collection, Sierra Club Angeles Chapter Archives. Bottom: Bill Oliver collection. "My father passed away yesterday. I'm 73. My dad was 30 when I was born. This is the first day I've lived without having my dad. [When I was young,] my mother wanted us out of the house, and Dad would take us on walks in the San Rafael Hills in Pasadena, California. I would run ahead, but he asked me to stay with the group. He modeled for me how to take walks at a steady pace. He modeled this to me for life. "We were a camping family. The reason we couldn't have a TV or an extra car was that we devoted our time and resources to the outdoors. We camped in state parks throughout California. My father was a Scoutmaster and planned trips. 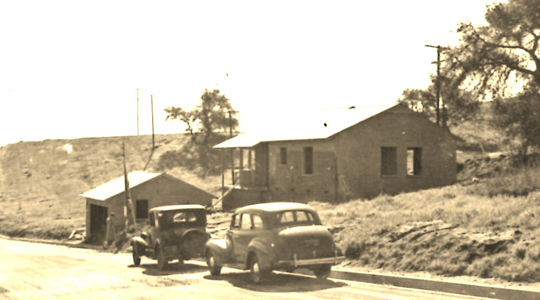 In 1956, on Easter, we camped off the coast of Ensenada. We were on an uninhabited island for a week. The next year at Easter we rafted the Lower Colorado River for a week. We went from Hoover Dam and camped along the river as we went down. The next year we went to an oasis of palm trees in Baja North, right in the middle of the two coasts. "My father, though he took High [Trips] with the Sierra Club, took his family on base-camp trips. I was 11 when he took us up the 13,361-foot peak Hilgard. It's not a steep climb, but from the summit you can look down on Seven Gables and Bear Creek Spire. When we descended we rappelled down, that was the first and only time that dad taught us what he knew about rock climbing and things like that. "One of dad's sayings was 'No scene twice seen.' If we went somewhere one-way, we came back another way. He was a beloved guy." "In the course of 100 years, Dawson's Books had five locations in LA. In 1928 [Glen] went to Europe with his father. They had a philosophy of combining business with pleasure. My dad took a year off from high school to do this. That's when Glen climbed the Matterhorn with two guides. One guide was for his dad and one was for Glen. "There was an arrangement—they would send crates from Europe to Dawson's Bookshop. Dawson would sell these to the Huntington Library and other places. This bookstore, which also carried rare mountaineering titles, created a clientele of collectors. The bookstore is still open online. Michael Dawson, Muir's son, carries it on. "My dad published the early California Travel Series. 50 different books printed by 50 different presses in Southern California. He sold these to universities and college libraries. Then he started the Baja California travel series. That set was 50 as well. He ended up publishing 350 titles. That number could be skewed because he published mini-books. He wasn't so much an author, but he was more of a publisher." "I met Glen in February of 2009 at his apartment in Pasadena, where he treated my wife and me to lunch and then spent several hours with us going over scans of his 80-year-old photographs. His eyesight wasn't one hundred percent but his memory gave us identification of nearly every face and place that we showed him and a story to go with each. It was easy to get distracted looking around Glen's place as it was full of a lifetime's collection of artifacts. He brought out a carved ivory cleat off an ivory canoe. He told me John Muir gave it to his father. He showed me a painting by Leland Curtis. It was painted about the same time Ansel Adams photographed Frozen Lakes and Cliffs. His whole place was like that. "Glen had made the long-lost negatives in the summer of 1931, when he and his Sierra Club comrades made their historic climbs. His friend Jules Eichorn wanted copies made, so Glen shipped them to Lewis in Alameda where he could make copies in his darkroom. Somehow they were never returned and remained hidden away until after Lewis Clark's death in March 1991. I stumbled on the photos at a garage sale in spring 1992, bought them, and with the sole clue that they involved the Sierra Club, I puzzled over them for many years until I happened on William Alsup's Missing in the Minarets. Here I saw prints from this amazing story and realized that I had found a lost hoard of photographic history. It was a short trail from there to Glen. "My single meeting with Glen left a lasting impression, and I treasure that meeting on a cool February afternoon." "Today, every imaginable climbing record has been set for each 14,000-foot peak in California: by the shortest possible time; by the youngest or oldest; one-day ascents; solo climbs; from the lowest to the highest point; with dogs. Whatever the feat, the mountains are still there for all to enjoy." 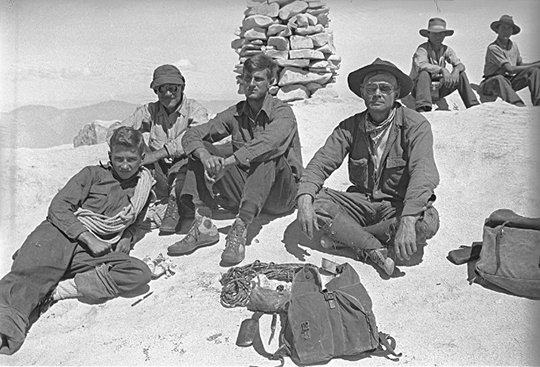 Top photo, Glen Dawson, Jules Eichorn, Norman Clyde and Robert Underhill atop Mt. Whitney after their East Face ascent in 1931. Bottom photo, Eichorn and Dawson reunited at Dawson's Book Store, April 1990. 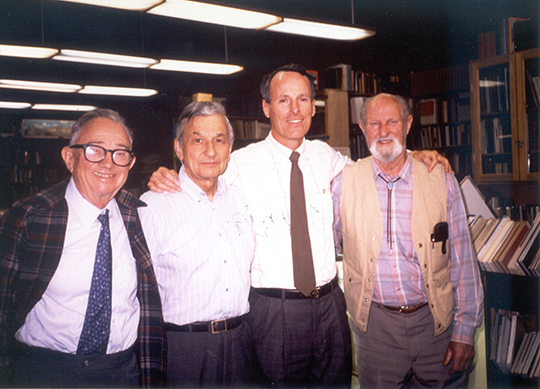 Left to right: Glen Dawson, Muir Dawson, Bill Oliver, Jules Eichorn. [Top Photo] Sierra Club Angeles Chapter Archives. [Bottom Photo] Bill Oliver Collection.